New Delhi: On account of its doctors misreading an ECG highly suggestive of Myocardial Infarction, which finally led to a patient’s death, the Delhi State Consumer Disputes Redressal Commission has directed Max Hospital, Pitampura to compensate an amount Rs 24 lakh to the deceased patient’s family. The concerned case goes back to the year 2006, when the 48-year-old patient, GK Jaggi was rushed to the hospital, following the complaints of sudden onset of pain in both of his legs radiating into his lower abdominal region. According to the observation made at the emergency block, the patient had a history of Hypertension but no medication, a development of burning sensation in the chest along with pain. At that time, the patient’s had BP 150/80 and blood sugar 181 high. Thereafter, he was administered injections of Voveron [Diclofinac- Anti-inflammatory and analgesic] as also Pantocid [Pantoprazole Sodium- Proton Pump Inhibitor works on the Gasto-intestinal Tract] as also the oral administration of syrup Mucaine Gel [Oxethazaine+Aluminium Hydroxide+Magnesium Hydroxide in oral suspension- used to treat acidity]. At 9.05 am, the Cardiac Monitor in respect of the patient reported a straight line. Accordingly, CODE BLUE was announced and thereof the team of doctors commenced CPR, however, unfortunately the patient could not be saved and was declared dead at 9:38 am. Alleging that the err made by the doctor during the ECG observation, led her husband’s death, the complainant in the case, Suman moved the consumer forum. She complained to the commission that the doctor did not ask for further Cardiological consult and the patient was virtually unattended for the crucial 40 minutes. It was averred before the court that the doctor, instead of understanding the etiology of symptoms, holistically and seeking the most basic of investigations to rule out the occurrence of a Myocardial Infarction being suffered by the patient, got a solitary ECG conducted and misread the same to be Normal and thereinafter decided to treat the patient symptomatically only. In response to the allegations made against them, the hospital and the doctor stated that the complaint is founded on false and frivolous grounds. They contended that the family, themselves are responsible for the result since the patient was not brought to the Hospital for treatment in time. Keeping in view the report of the Committee, we are satisfied that the negligence on the part of the OP is writ large on the face. Negligence is the breach of a duty caused by omission to do something which a reasonable man guided by those considerations which ordinarily regulate the conduct of human affairs would do, or doing something which a prudent and reasonable man would not do. The definition of negligence as given in law of torts by Ratanlal and Dhirajlal holds good. Negligence becomes actionable on account of injury resulting from the act or omission amounting to negligence attributable to the person sued. Ultimately, keeping in view the report of the committee, the court held that the hospital and the doctor were negligent while treating the patient and directed the hospital to pay Rs 24 Lakh to the deceased patient’s family for the suffering, mental pain and agony caused as well as an additional Rs 2 lakh towards litigation expenses. Now if the opinion is overturned in the higher court, will the lower court judge be sued for negligence? This case has strong similarities with my younger brother\’s case who died of gross, reckless and criminal negligence by Dr. Atul Chhabra at Tata Main Hospital, Jamshedpur. My brother was rushed to the Emergency Ward late in the evening (10.30 PM) of 20.05.2011 with complaint of extreme uneasiness and severe chest pain. 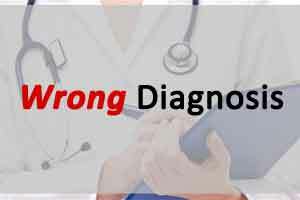 Dr. Chhabra ignored all six glaring symptoms of an impending cardiac arrest viz compliant of uneasiness and chest pain; high blood pressure (150/100mmHg) ; irregular and abnormal ECG recording in emergency ward; family history of cardiac ailment and death of father of deceased from cardiac arrest and obesity. Dr. Chhabra in blatant disregard of such glaring symptoms misdiagnosed the ailment as hyperacidity and administered pain relieving injections for abdominal pain instead of following standard treatment guidelines/ protocol for cardiovascular disease. Further, the accused doctor fatally discharged the deceased after prescribing medication of Alprax and Rantac tablets for treating gastritis for three days and report back to medical OPD after 3 days. The following morning on reporting for work the deceased again experienced chest pain. The deceased was rushed to another hospital but before he could meet a doctor, he suffered a severe heart attack, collapsed at the OPD entrance and died in 10 minutes. Vide its decision dt.12.12.2014, MCI merely issued a grossly inadequate, grossly disproportionate, non speaking and non reasoned “warning” to Dr. Atul Chhabra to be “more careful while dealing with such types of cases in the future”. No findings vis-a-vis six serious allegations of gross negligence were returned by MCI. Aggrieved by MCI’s attempt to dilute a case of gross medical negligence, the Petitioner vide an RTI Application dated 27.12.2014 solicited detailed and reasoned findings from MCI and subsequently, on information being stonewalled filed RTI Second Appeal before Central Information Commission . The Hon’ble Commission was pleased to pass an order dated 23.12.2015 which directed MCI to furnish detailed findings vis-à-vis serious allegations of gross negligence within 12 weeks of receipt of its order . However, MCI did not comply with Hon’ble Commission’s order. Then, the Hon’ble Commission vide order dated 23.05.2016 threatened penalty proceedings against MCI . In the meantime, as a face saving exercise, the Ethics Committee of MCI re-opened and re-examined the case, heard the Petitioner again and inserted post decisional findings whereby it held the accused doctor guilty of cognizable negligence on six counts and recommended that the license of the accused doctor be suspended for 6 months. The findings were produced by MCI before CIC vide letter dated 21.07.2016 to avoid penalty proceedings. However, MCI vide the same letter and after taking legal opinions held that it is beyond its purview to enhance the quantum of punishment to the accused without affording an opportunity to the accused to he heard again. Hence, the decision of warning was maintained. Later, Hon\’ble Delhi High Court set aside MCI\’s decision or warning and remanded the case back to MCI to decide it fresh. MCI is yet to give a final decision even after a lapse of 1 year since remand by Delhi High Court. Consumer Case No. 83 of 2013 is pending before NCDRC for last 5 years. Criminal complaint was filed too and F.I.R and the trial is yet to start. The failure is of the doctor panel which gave a confusing report. A clear cut report from the doctors panel absolving the doctor and the hospital would have clarified the matter which actually is..that is there is no negligence here. Actually this case doesn’t even merit a clinical discussion whether there is any negligence because the details provided and absurd to reach a conclusion that T inversion in I aVL was the cause of the death. Also error of judgement should be differentiated from negligenc and any compensation or punishment should only be restricted to negligence. Hope the higher courts rectify the gross mistake being done unless there are other details which has not been brought out in the report provided. Expert committee of doctors should have played a bigger role..
MBBS doctors can\’t act like specialists.. Emergency care is different and we are not having adequate specialists in emergency rooms..
What an immature, inappropriate, poorly researched judgement! If a PG student or cardiologist opines this on an ECG in the exam, he would be failed. However, our courts are accountable to nobody and do not need any justification for their decisions. The blind leading the blind. It is time that the practice of medicine be handed over to lawyers and judges. A date can be taken for the diagnosis of all emergencies and after the court gives the diagnosis, the treatment can be started after a panel reviews the data. If the patient survives, the treatment can then be started. It\’s not about confirmation . It\’s not doing further work up after ECG indications.. Most on duty doctor\’s r MBBS only.. That\’s the prob.